A pillow of marshmallow possibly spiced with nutmeg, streaked with what might have been cinnamon, sat in the middle of a white shallow bowl, and a waiter poured a purée of butternut squash to surround it. 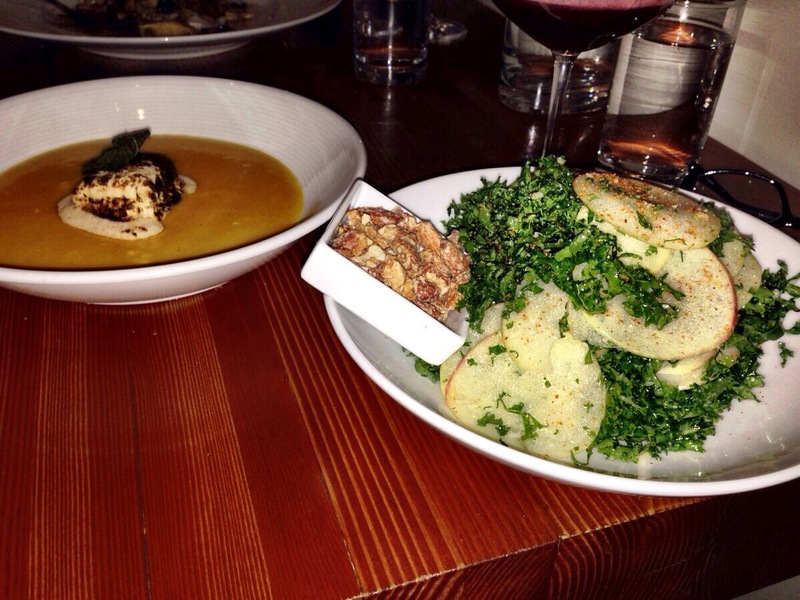 This was soup at the Oak on Thirteen, and my salad of choice was its fabled kale and apple. I asked for the candied almonds on the side, which I nevertheless happily nibbled on throughout the meal, but I admit it makes for a poor photograph. Andrew Wille the book doctor himself suggested the salad. Boulder is about the mountains and running and bicycling, but for me it is about food. It is one of a handful of American cities not only thoroughly inviting for vegetarians but offers a level of culinary sophistication that makes me savor each meal. One day I ate maki, full of tender sweet mushroom and pickled gourd, drizzled with tamari and wasabi. I drank elixirs of fruit and vegetables, frothy cappuccino and lots of water. I was there for a class and reading, and enjoyed the company of old friends, and new acquaintances,as well as students who were strikingly engaging, articulate, and welcoming. I bragged about my own students on the East Coast, as well as the kittens I am fostering. In the midst, my father called to tell me his brother passed away, and I sat outside the Trident Cafe, listening to details, remembering the premonition I had felt earlier in the day. How close are happiness and tragedy, chasing one another, waiting for their turn. My visit was over too soon. I tucked a newly purchased volume of Elizabeth Bishop’s prose, and a pack of pencils and pens I bought at a favorite store. The pencils had replaceable erasers. The farmers were setting up the market as my bus rolled past, headed to the airport.